Hello! I’m a 26 year-old illustrator who’s been traveling & working remotely for a little over a year. I was born and raised in Los Angeles, California and spent 6 years in New York City before going fully nomadic. After successfully working from home for two years, I woke up one morning and felt like it was time for a change of scenery. I thought to myself, “New York will always be here. 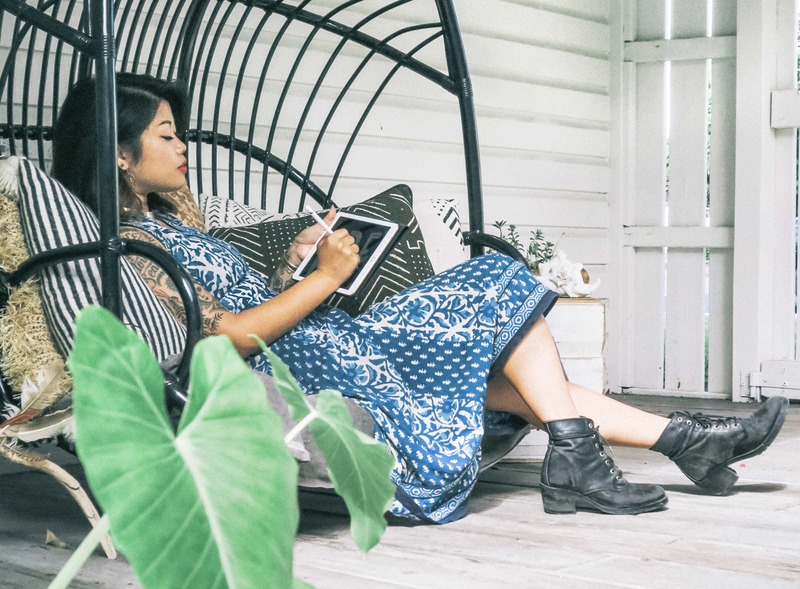 If I can work from home, I can probably work from anywhere.” Within six months, I sold everything in my apartment, stuffed my laptop, sketchbook and favorite sundresses in a 26L Patagonia backpack, and bought a one-way ticket to South America. I’ve spent the past few years growing my illustration business, and I’m currently focused on helping other creatives grow theirs! 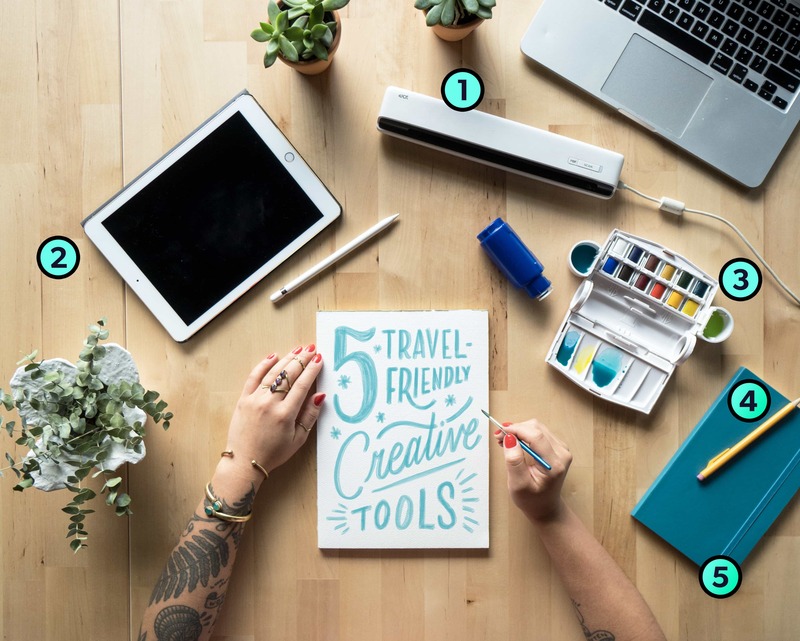 What are 5 creative tools you bring with you on the road? NeatReceipts Mobile Scanner: This is an amazing little scanner that scans up to 300DPI in color or black and white plus, its super lightweight. Great for when I want to do more analog artwork and get it onto my computer at high resolution. You simply hook the scanner up to your computer via USB drive, feed the paper through, and it scans into your computer. Plus, it's easy enough to store in your bag when not in use. I bought this before I even started traveling because I had such a small studio space when I first started working from home. I took it with me when I left to travel long-term, and it never let me down. If you’re going to use it for travel, definitely buy the one with the protective carrying case so it doesn’t get banged around in your bag. At the time of this post, Neat for Mac is not compatible with macOS High Sierra. iPad Pro and Apple Pencil: So convenient for drawing anywhere, anytime! When I was traveling through places that didn’t always have great lighting in rooms, it was difficult to draw on paper at night. And sometimes if you’re on a train or a plane, you can’t just take out a pad of paper and your watercolors to do the work you want to do so an iPad has been a great way for me to have access to creating work anytime, anywhere. You literally have every medium and every color at your fingertips. I resisted working completely digitally for a long time because I didn’t think I’d be able to achieve the same hand-done results, but the quick-charging Apple Pencil was way more intuitive than I thought, and it’s sped up my workflow so much. I like to use the Procreate drawing app. You can also use Astropad to use your iPad as a drawing tablet with your laptop or computer so you can work straight in Photoshop or Illustrator from your iPad. Pretty cool. Winsor & Newton Cotman Water Color Field Plus Set: This super compact and concentrated set even comes with a water bottle and two little water holders so you can paint anytime! Before getting this set, if I wanted to use watercolors in a cafe or coffee shop, I’d have to ask the barista for an extra paper cup and water, which they didn’t always have. I always felt too awkward to ask for a nice ceramic cup to hold paint if they didn’t have a paper or plastic one. The water canister in this set is a life-saver. This also comes with a small, decent paintbrush. Good for brush lettering and illustration! I love that everything in this set is compact and self-storing. Paper Mate SharpWriter Mechanical Pencils: Mechanical pencils are great because you don’t need to sharpen your pencils and deal with shavings, which can get annoying while on the road. Not to mention the added bulk of carrying around a pencil sharpener—every ounce counts! Any mechanical pencil will do, but I like the Paper Mate SharpWriters because they’re cheap, functional, and they look really cute in Instagram photos. What’s not to like? Just carry some extra lead and an eraser with you, and you really only need a few of these to last you for a very very long time. Moleskine Soft Cover Dot Grid Notebook: Dot grids are great for regular drawing or lettering since it’s less intense than a straight up gridded notebook. You can barely see the dots if you snap a photo of your notebook, which is nice as well. The paper weight with these notebooks are good, but I wouldn’t recommend using a heavier marker like a Sharpie to draw on it. If you do, put another piece of paper underneath so it doesn’t bleed onto the next page. In addition to nice paper, this notebook offers an elastic strap that you can use to close your notebook so pages don’t get accidentally bent or folded while it’s in your bag. Plus, the cover is flexible and stain-resistant because of the slicker, synthetic material. It looks natural and not cheap. There's also a pocket in the back that I like to store tickets, receipts, and notes in. Prague in the summer & Bali in the fall have been my favorites so far. Growing up in Southern California equipped me with zero tolerance for cold weather, so I exclusively travel to warm, sunny places. I’ve been chasing summer all year long, which is probably why I was able to pack so lightly. I always bring snacks with me when I’m about to board a plane, train, bus, or car. But they’re not just for me to eat. Backstory: I was boarding an early flight to Prague from NY and in a pretty sour mood. I had only gotten 4 hours of sleep the night before, and I had to work on the plane because I had an illustration deadline to hit when I landed. A man when a nasty cough came and took the seat next to me. He didn’t speak English but waved and smiled. I nodded back weakly, unenthusiastic about having to sit next to someone coughing for a long flight. An hour later, I saw him buy a can of Pringles from the snack cart. Out of the corner of my eye, I saw him open the can, turn to me, and offer me the first one. I don’t know about you, but I’ve NEVER offered anyone the first Pringle before (get your own). My cold, dead heart immediately melted, and I realized that I was being self-centered and grumpy for no good reason. The act of offering someone food is a gesture of kindness that transcends language, religion, and culture. From that moment forward, I made a vow to always share food with strangers. So far, I’ve offered popcorn to an Uber driver in San Francisco, apples to a family in a train car in Budapest, a tangerine segment to a taxi driver in Saigon, and chocolate to many seat mates on flights. It’s really incredible how warm people become when you make a simple offer like that. I wish there was a jacket with a tab that, when pulled, instantly deployed large 360 degree airbags around me. I would use it every time a creepy dude tried to approach me on the street and/or if I was falling off of a cliff. Definitely my Vitamix blender for fruit & veggie smoothies. I used to own a small travel blender too, but when I decided to travel with just a carry-on bag it was impossible to bring it with me. Reluctantly, I had to chew all of my food this year. You can find Lauren on Instagram. This has Lauren trademark cheerfulness & boundless creativity. Thanks for a great read.